Description of Principle: Engine performance can be determined by running the engine on a dynamometer. There are two types of dynamometers to measure engine performance, an engine dynamometer and/or a chassis dynamometer. An engine dynamometer measures brake horsepower, (also called SAE NET) and torque at the back of the engine. A chassis dynamometer measures horsepower and torque at the wheels of the vehicle. Either way, when a dynamometer test is taken, the results are printed out and read on a performance chart as shown in the picture to the left. This chart is the result of doing a dynamometer test to determine brake horsepower and torque at the rear of the engine. This chart has three axes. The left vertical axis reads in brake horsepower. The right vertical axis reads torque in lb. ft. The lower horizontal axis reads in revolutions per minute or engine rpm. 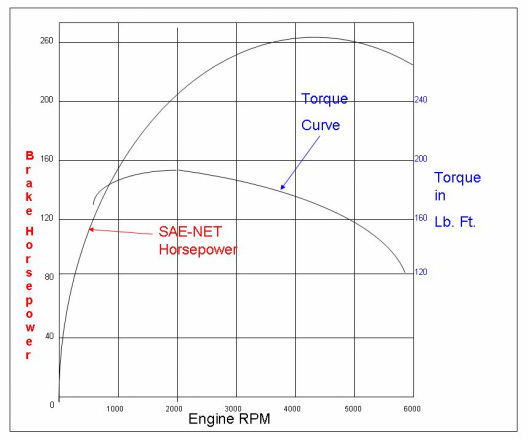 There are two curves in this chart One is the horsepower reading, called SAE NET and the other is the torque readings called torque. Reading this chart, this engine is capable of producing about 260 brake horsepower (SAE NET) at 5000 rpm. It is also capable of producing a maximum torque of 190 lb. ft. at 2000 rpm. Knowing these engine characteristics can be important to the street rod enthusiast. This becomes important when selecting engines for a particular vehicle weight, Also, it may be important to know the best rpm to produce a specific torque, and the best rpm to create the highest brake hp during certain performance conditions. Although this performance chart shows two curves, others may also show fuel consumption curves.